Powers/Abilities: Agent L was skilled at espionage. History: (Strange Tales I#137/1) - When HYDRA was preparing to unleash its Betatron Bomb, Agent L decided to defect, despite the fact that no one had ever defected from HYDRA and lived. He went to a train station to meet with an agent of S.H.I.E.L.D. and deliver a roll of microfilm of the Betatron Bomb to him, but a HYDRA agent disguised as a blind flower seller who had suspected his defection shot him just as he reached the train car. Before dying, Agent L threw the microfilm to the S.H.I.E.L.D. agent. This unidentified (but tremendously heroic) S.H.I.E.L.D. 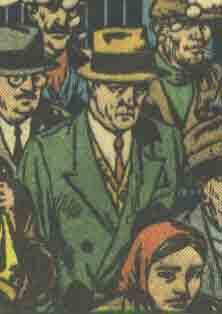 agent went to meet Agent L in the Balkans to obtain the microfilm of the Betatron Bomb. 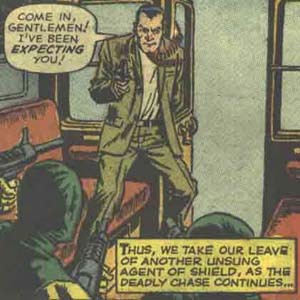 Although Agent L was killed by HYDRA, this agent escaped aboard a train with the film. However, HYDRA pursued the train, and he contacted S.H.I.E.L.D. agents Bill and Joe, transferring the film to them. He could have left with them, but needed to hold off the HYDRA agents so that they could escape. Just as Bill and Joe departed, the agent turned to face the HYDRA agents and his own certain death. Bill and Joe were two S.H.I.E.L.D. agents equipped with a Ferrari which could be sealed up for an underwater marine dive. Gabe Jones knew both of them. When Agent L's microfilm was in danger of being captured by HYDRA, they came to pick it up from the S.H.I.E.L.D. agent transporting it. They were followed by other HYDRA agents, and fled into the ocean to escape, but an HUAF (HYDRA Underwater Assault Force) came after them, and began to break into the car. 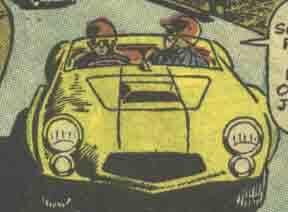 With no other options, Bill and Joe activated the car's self-destruct, killing themselves and all of the HYDRA agents.